By Peter Anderson 14 Comments - The content of this website often contains affiliate links and I may be compensated if you buy through those links (at no cost to you!). Learn more about how we make money. Last edited April 22, 2019 . One of the keys when it comes to investing for the long term is to make sure you're minimizing the fees you're paying to invest your money. Whether it's plan administration fees for the company you're investing with, mutual fund expense ratios and fees, or fees for added account functionality, the more you can minimize how much you're paying, the better. Morningstar reports that the average expense ratio for actively-managed equity mutual funds is 1.2% and investment grade bond funds have an expense ratio of 0.9%. For me, I prefer to invest in mainly low cost index funds with expense ratios that are much lower. Beyond saving money on the expense ratios, I also would love to save money on the administration fees I pay in order to invest. My company 401(k) has fees just under 1%, which is way too much for my tastes. I've stopped investing there first since there is no company match. I have an account with Betterment, and I love their automated investing service, but they still have a .35% annual management fee on my sub $10,000 balance. This past week I was doing some research on the new slate of robo advisors that have popped up, and one of them jumped out at me because the company advertises itself as the world's first FREE financial advisor. Not only do they invest your money for you in a slate of well diversified ETF index funds, and rebalance your holdings on a regular basis, but they don't charge you any fees in order to do so. This all sounded too good to be true, so I decided to do a full review of this new automated investing service called WiseBanyan, to see what they are all about. 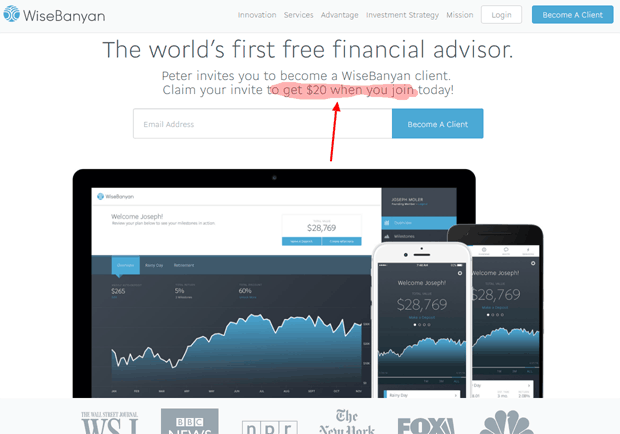 Just about 5 years ago WiseBanyan launched with the goal of being the world's first completely free financial advisor. Here's their reasoning behind why they launched their site. Herbert Moore and Vicki Zhou founded WiseBanyan after seeing that the incentives between financial advisors and clients were often misaligned. They saw this firsthand while working in asset management and investment banking respectively, and later as colleagues at a quantitative asset management firm. They realized that the main cause of misalignment was a conflict of financial interests, which often resulted in high fees, unnecessary tax consequences, and unreasonable account minimums for the clients. As a result, they set out to build a company that was not incentivized to earn money at its clients’ expense. WiseBanyan began with the idea that investing is a right – not a privilege. Our mission is to ensure everyone can achieve their financial goals, which starts with investing as early as possible. This is why there is no minimum to start and we do not charge fees. We hope you are as excited about WiseBanyan as we are, especially what it means for you, your friends, and society as a whole. 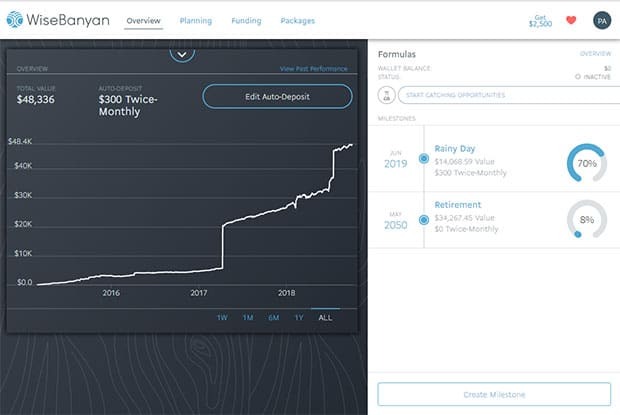 WiseBanyan was launched with the hope of making investing easy, accessible and cheap – even for beginning investors who could only invest a small amount every month. 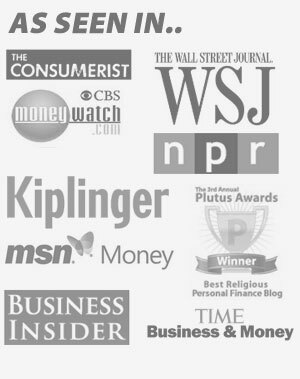 We have paid investing and client services to compliment our free managed portfolios. Every paid service will have demonstrable value to clients – an example of one product is “Tax Protection” which includes tax-loss harvesting. So the core product is free, and will remain that way, while there will be fees for some add-on products like tax loss harvesting. After I had clicked on the link in the welcome email, it dropped me right into a brief questionnaire to assess my risk tolerance, time horizon for investing and more. While you're answering the questions you'll see a progress bar and a “current risk score” listed to the right, telling you just how conservative or aggressive WiseBanyan believes you are. I decided that I wanted to change my risk score and asset allocation to be a bit more aggressive, however, and you can do that simply by moving the slider to the right (or left if you're more conservative). I ended up with closer to a 75/25 stocks to bond allocation. After completing the survey you click on the “Open My Account” button, which takes you into the account opening process. It will ask for all of your personal information including an email, password, employment information and social security number (like you would have to at any brokerage). After you choose an account type you'll be asked to link a bank to fund your account. You can then choose to fund the account with as little as $10. If you want, you can also set it up to automatically invest for you every month. For now I chose not to do that. Once you're done your account will be sent to WiseBanyan for approval. Their site says it takes about 5 business days for an account to be approved. 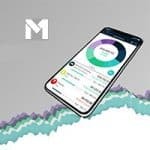 WiseBanyan will invest your funds based on Modern Portfolio Theory (MPT). We use the tools of Modern Portfolio Theory to design the optimal portfolio for a given level of risk. In addition, we further optimize our investment process to minimize tax consequences and streamline the reinvestment of dividends and contributions. WiseBanyan will attempt to give you a portfolio that is well diversified, low cost, and at low minimums so just about anybody can get started now. 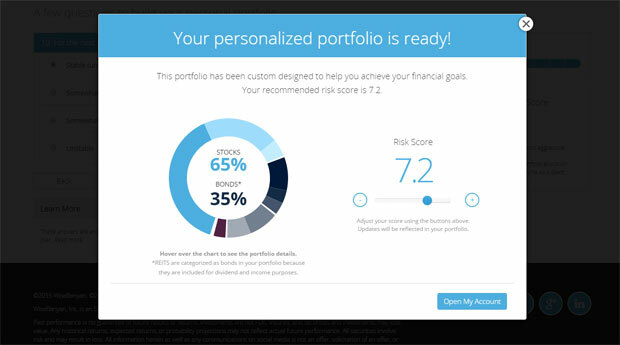 They'll use the ideas behind MPT to give you the optimal portfolio for your given risk score. So what are you getting when you invest with WiseBanyan? You're getting a well diversified portfolio that contains passively managed exchange-traded funds (“ETFs”). As you can see they have a broad diversification that also includes real estate via the Vanguard REIT Index fund, which isn't something that Betterment gives you. When the service first came out one of the complaints some users had was that there was no mobile app for the service. As of January 2016 there was a mobile optimized app for iOS released, and shortly thereafter an Android app was released as well. From the app you can now do things on the go like check your balances, view your allocations, make a quick deposit and more. The apps really are very pretty to look at, and are a pleasure to use. 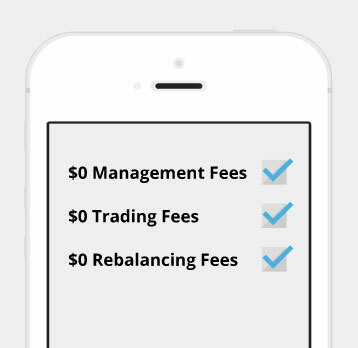 So essentially the WiseBanyan service is free to use with no management or trading fees, and no fees to rebalance your account. Competing services like Wealthfront or Betterment will charge anywhere from a 0.15%-0.35% annual management fees, so right off the bat you're saving those fees, which can add up over time. There are some fees related to transferring funds via wire transfer, or do a full account transfer out, although regular electronic funds transfers (EFT) are free. Electronic Fund Transfer (EFT) fee: FREE for deposits or withdrawals. Wire transfers in: FREE (although your bank may charge). Wire transfers out: $30 per wire transfer. Full account transfer out fee: $75 per account. Partial account transfer out fee: $5 per security ($25 minimum/$75 max). Disbursement of funds by check by mail: $20 per check. Returned EFT or check fee: $35 per occurrence. As mentioned above, WiseBanyan's product and service is free with the exception of a few small fees for certain types of transfers, or check disbursements. They plan on making their money through add-on products and services. There are several premium add-ons in your WiseBanyan account that have a fee associated with them. You can turn them off and on whenever you want. Portfolio Plus: The ability to create your own custom portfolio from an expanded list of investments. You can choose from lists of different investment classes and types and add up to 20 investments to each portfolio you create. It costs $3/month to use this add-on package. Fast Money: When activated this gives you quick same day deposits, auto-deposit scheduler and overdraft protection. It costs $2/month to use this add-on package. Tax Protection: This package will give you “WiseHarvesting” tax loss harvesting, selective trading (to remove ETFs you hold elsewhere to avoid potential for wash sales) and IRAutomation, which helps you to maximize the use of your retirement account deposits, setup auto deposit plans and more. Each month the cost will be the lesser of 0.02% of your average WiseBanyan account value (0.24% annually) or $20. So if you have $5,000 in your account, the monthly cost would be $1. Using these add-on packages is purely optional, but even if you were to turn them all on it likely isn't going to cost you more than a few bucks per month. When I first read about WiseBanyan I dismissed it out of hand because I thought that there had to be a catch somewhere, there's no way they were offering this service for free when others are charging anywhere from .15%-1.0% annual management fees for similar services. After looking into it further, however, it does truly seem like WiseBanyan is committed to offering a fee free investing service, and plan to keep it that way. The question is – is it sustainable? They intend to make money for their service via add-on products, like tax-loss harvesting, but we'll see if that will be enough to keep them going for the long term. For now, however, it does seem like a good option for newer investors. Not only can you start investing with no account minimums, and no management fees – but you can buy fractional shares with as little as $10 and get a highly diversified portfolio that should match the market in the long term. The account has SIPC protection that covers up to $500,000 per client as well, so if WiseBanyan were to go under you'd be covered. 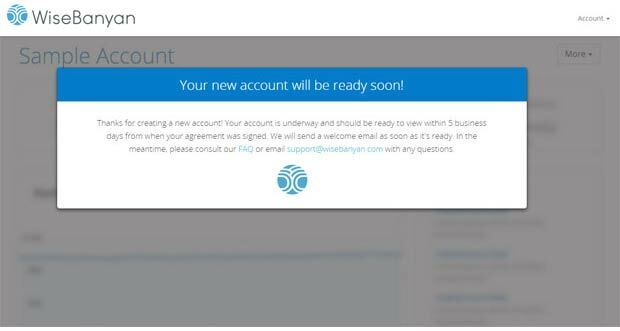 I've signed up for my own WiseBanyan account and have been with them now for a couple of years. They are one my new go-to recommendations for new investors. Open your own free account below via my invite link. Get Your WiseBanyan Account Now! Wealthfront is one of the most well respected automated investing services (robo-advisers) available today. Let's take a look at what sets them apart. I continually read that not having a mobile app is a con. In this world everyone feels the need to be in constant contact with everything. I believe this is a pro and not a con. This is investing not trading. There is no reason to feel the need to check on the balance every day or for some multiple times a day. It would be best if they only looked monthly or even less. This is the type of account that you set and forget and let time and compounding work its magic. If you want to be a trader and not an investor there are plenty of other options. I am also concerned about the free platform and how long it can last but they are SIPC covered so if they would go out of business my investments are safe. If anyone wants to try them out and avoid the waiting list here is my referral link. https://www.wisebanyan.com/referral/qSrQy7AmY. I used one to avoid the wait list to join. Some months ago I was very surprised to read about a fee free no cost advisory service for investors. I was put on their waiting list and completely forgot about it until I read a review of it and then contacted them. I was accepted and began the rather simple sign-up procedure, but had questions about the firm after reading their required contract and did not complete the final step. I’ve been a small investor using my personal research, Motley Fool for advise and Foliofn investing service as my broker for about 3 years. I’ve had moderate success with portfolio rate of return is over 35% which is all well and good. Foliofn is also WB’s broker which charges either an unlimited annual fee or a quarterly charge depending on your activity and imposes fees for limited, stop orders, etc. Do you know if WB will provide tax documents similar to Foliofn, ie gain/loss, 1099B, etc? Also I’ve read in another review that they are registered with SIPC but your investments are not protected if they go bellyup. Any thoughts on that? 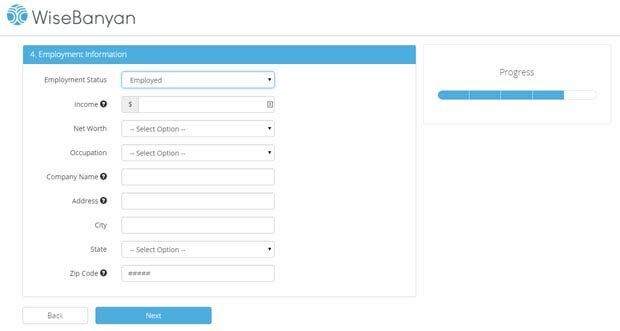 You can download your tax documents in your account by clicking the “More” button in the upper-right corner of your WiseBanyan dashboard and selecting “Documents.” You will receive an email during tax season when your documents are ready to view. Your money is held in a brokerage account in your name with a broker-dealer registered with the Securities and Exchange Commission (“SEC”) and the Financial Industry Regulatory Authority (“FINRA”). Your account is covered and protected by SIPC in the extremely unlikely event that the brokerage firm was to become insolvent. SIPC protects investors against losses that stem from the financial failure of a brokerage company. If a brokerage fails, SIPC will cover losses up to $500,000 with a limit of $100,000 for cash losses. To learn more about SIPC protection, please visit sipc.org. Your account is also covered by the broker-dealer, FOLIOfn Investments, Inc. (Folio), as an additional level of protection. Folio customers receive additional account protection through some underwriters at Lloyd’s, London. While the underwriters cover losses up to a total of $50 million for all Folio customers in any one policy year, the maximum amount any single Folio customer may receive is $4.5 million for securities. The underwriters’ coverage is governed solely by the terms of the policy issued by them. If you wish, you are entitled to inspect the policy or obtain a copy for your records. I started with Wisebanyan early last year, changing from Betterment. Besides not having fees beyond what is included in each ETF itself, the average expense ratio for the funds is 0.11% with Wisebanyan vs 0.14% with betterment. While they do use many of the same funds, Wisebanyan avoids US Short Treasury bonds and instead goes more for TIPS and high quality corporate bonds, which while still being quite safe investments, have more growth potential, and even pay dividends! Also, as a “Founding” member, I have been given Tax-Loss Harvesting free for 6 months. I have noticed it works much more actively than Betterment’s. I have only good things to say, and good experiences with Wisebanyan. Very happy with with the service provided! No need for a mobile app, if I want to see how the account it doing I just log in at home. No need to check while at work or out in the town. I currently have $4280 invested with WiseBanyan in my Roth IRA there. The returns are around 1.2%, which I think is about what the markets as a whole have been over the same time period. I’ve been happy with the service, especially with the zero costs I’ve incurred for using them. I’d still recommend them. If you’re interested in WiseBanyan, you can read more about my “Digit and WiseBanyan Experiment” here. Thanks for your reply. Appreciate it. I think I will give them a shot. I signed up in June 2016. I didn’t chose the aggressive investor option. I just wanted to test the waters to see how the service is, so I decided to reach a milestone of $5000 in 18 months – a 70/30 mix. Currently I have a return of 4.4% and in a couple of months I will reach my goals. My question is that during tax season, do I have to include this in my tax returns? It all depends on what type of account you opened, whether you’ve sold the investments or not, etc. I’d recommend speaking with a tax professional to figure out what you’ll need to claim in your situation. It gave me a link too! This one allows you to skip the waiting line to get in right away and get a free $20 into your account! I stayed with Wisebanyan for 3 yrs. The thought of free was great. But as the years went on they added fee packages that don’t make sense to me. Being a founding member I got 30% off the fees, but still didn’t make sense to me when I took the time to really look around and compare. If you don’t add any fee services you just get the account and rebalancing. If you want “Wise-Harvesting” you pay .25%. Now if you really want “Tax Loss Harvesting” and are a beginner you can get $15k managed for free with Wealthfront by signing up through multiple financial web sites, including this one. With my account value, around 55k, and the first 15k managed for free I get more value for less fees at Wealthfront. Now Wisebanyan has added Fast Money, which to me is a scam. Pay $2+ a month so your investment happens 1 day sooner? Doesn’t make sense especially if you read what they stand for. They also now have what they call “Portfolio Plus” which says it allows you to customize your portfolio for $2+ a month. Now what made me to close my accounts was when they started the Tipping option. You can now Tip/Donate $1-$10 a month to help them “spread the word”, with 10% being donated to charities. To me “spread the word” means that they are running out of capital and asking the people they once said they were helping to invest to fund their company. I really don’t think they will be around in a year from now. I gave them three years and am moving on. Wisebanyan could easily cost more in fees to people than other well established players if people don’t pay attention to what’s being offered to them. For a company that advertises “Free” they cost a lot. Previous Post: Swagbucks Review: What Is It, How Does It Work And What Can You Earn And Win?